This article is the first in a two-part series on the millennial generation's spending habits. Among Americans overall, spending has declined since 2008 -- the year of the financial crash. 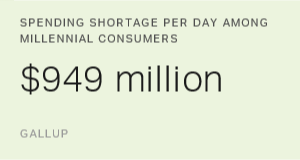 Currently, the millennial generation spends an average of $85 per day and accounts for 28% of all daily per-person consumer spending in the U.S. -- a number that is expected to climb as high as 35% over the next 15 years. The U.S. economy has been recovering at a slow pace over the past eight years, with young adults' spending hit hardest by this lethargic progress. Gallup's latest report, How Millennials Want to Work and Live, reports that in 2008, Americans aged 19 to 35 were spending an average of $98 per day. Among that same age group now, average daily spending has fallen by $13. Among older Americans, spending is close to -- if not on par with -- 2008 levels. Perhaps because of their lower wages and higher amounts of student debt, millennials have been unable to catch up to 2008 spending levels, while older generations are less likely to have those constraints. However, there is positive spending momentum among millennials. Across all generations, fewer than four in 10 Americans (37%) say they are spending more than they were a year ago, but a larger proportion of millennials (42%) say they are spending more. It is worth noting, though, that Americans -- millennials included -- are spending more on things they need than on things they want. More millennials report spending more on nondiscretionary categories such as groceries (52%), utilities (37%) and healthcare (35%), while fewer are spending more on discretionary purchases such as leisure activities (33%), travel (26%) and dining out (26%). Although many spending categories that Gallup tracks show the same patterns across all generations, millennials are more likely to be directing their increased spending toward a slightly different set of categories than is true for older generations. Groceries, gasoline, utilities and healthcare make the top six on the "spending more" list for all generations, but millennials also say they are spending more on rent or mortgages and on leisure activities. % "Spending more than a year ago"
Millennials' increased spending on leisure activities versus a year ago and versus other generations is intriguing, as it suggests they might be starting to free up their bank accounts and spend more on nonessentials. They are the only generation to do so, and this financial freedom presents a substantial amount of opportunity for brands that can connect with them. Are millennials more likely or less likely than other generations to be thrifty? There isn't a simple answer to that question, as the next article in this series will uncover. Download Gallup's latest report, How Millennials Want to Work and Live, to get further insight into Gallup's most important findings about millennials, including their demographic makeup, spending habits and desires for the workplace. Millennials are the most likely generation to switch jobs. One possible reason: They're the least engaged employees in the U.S. Leaders need to act fast to stop revenue declines from millennial consumers.